Just around Thanksgiving last year a car stopped at our house (which is nothing unusual, because it happens every day), and a woman jumps out, handing us a flyer which announced that she would produce water color images of your home, for loved ones in the city was one of the suggestions of why you would want one of those. The woman was Leslie Bender, a local artist. Her flyer was lying around for a while, being covered and uncovered, and with Christmas approaching E! 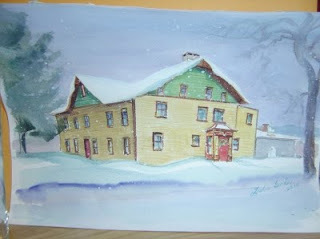 and I started talking about how cool it would be to have a painting of Gunk Haus which we could use on Christmas cards. This conversation quickly moved towards how cool it would be to have different local artists produce paintings / drawings / collages of Gunk Haus, not just for Christmas cards, but for display at Gunk Haus. One of those artists (for a while now I have been looking for an opportunity or excuse to mention her in my blog) could be our dear neighbor Ann Haaland, who has a great weekly blog about art and being an artist. To make it short (if you haven't noticed yet, I have the tendency to rambling), we didn't call Leslie until after Christmas. We asked her to paint Gunk Haus in a wintery setting, and today couldn't have been a better day to drop it off, because we got some three to four inches of snow today. 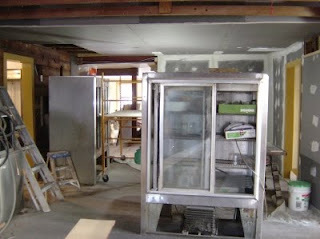 We continued preparing the beer hall for plastering, which will now happen on Saturday, because Jack's daughter fell sick. 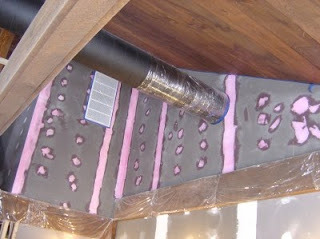 Here a picture of the AC duct covered in plastic wrap (a smart idea by my smart honey) to protect it from plaster splatter. We also continued hanging drywall today, and we are some three to four sheets away from having the entire first floor closed off (with drywall that is).